Does anyone have an easy method for cleaning aluminum similar to an oxalic acid bath or EvapoRust? I have been using mild abrasives, but am wondering if there is an alternative. Sounds like you may be looking for a chemical solution. I am not familiar with one. I normally use a polishing compound to make aluminum that is already in decent shape really sparkle. Mothers Mag & Aluminum Polish is my preference. A mild polishing compound will only do so much though. For most aluminum , I use a polishing machine with great results like the Super Champion rims and Campy hubs pictured below. I've also gotten these same results using 300-2500 grit wet sanding in stages followed by the Mothers compound. 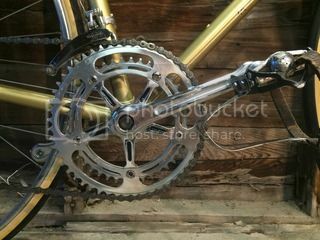 A whole lot more work but sometimes best thing for more intricate work like @OldsCOOL 's crankset there. There is a thread on C&V about various methods of cleaning and polishing....sometimes I like parts to be shiny like chrome, but sometimes I only want them to be satiny like original. Closest I came to the latter was 1000 wet/dry with WD40 (or some other lubricant) in a cross hatch pattern. Seems to do a good job removing small pits and scratches without going as far as the full on polish like @plonz shows (which is beautiful, I must say). For polish I really like Nev-R-Dull....also makes a good cleaner if the part is already pretty shiny. if it's real bad with scuffs and dings (like on a crankset or stem/bars), i'll deanodize and polish. if it's just dirty, like with hubs on a lower level flip, i'll use a spray lubricant and a rag/scouring pad. Here is a before/after (hoping that is obvious ) of the Shimano 600 pedal set I spent 2 hours on the other day. The 2hrs servicing was mostly absorbed in the cleaning sticky 30yr old grease, relubing and adjusting. Shiny aluminum is elegant. 2 hours cleaning 40 year old pedals followed by sleepless visions of your shiny new bits going round on your bike of choice... You sir, are infected. Back in my college days - when we had to go down to the Common Room in the dorm if we wanted to watch TV (Mash and Charlie's Angels)... I'd take a bike component with me and polish it with Simichrome while watching TV. 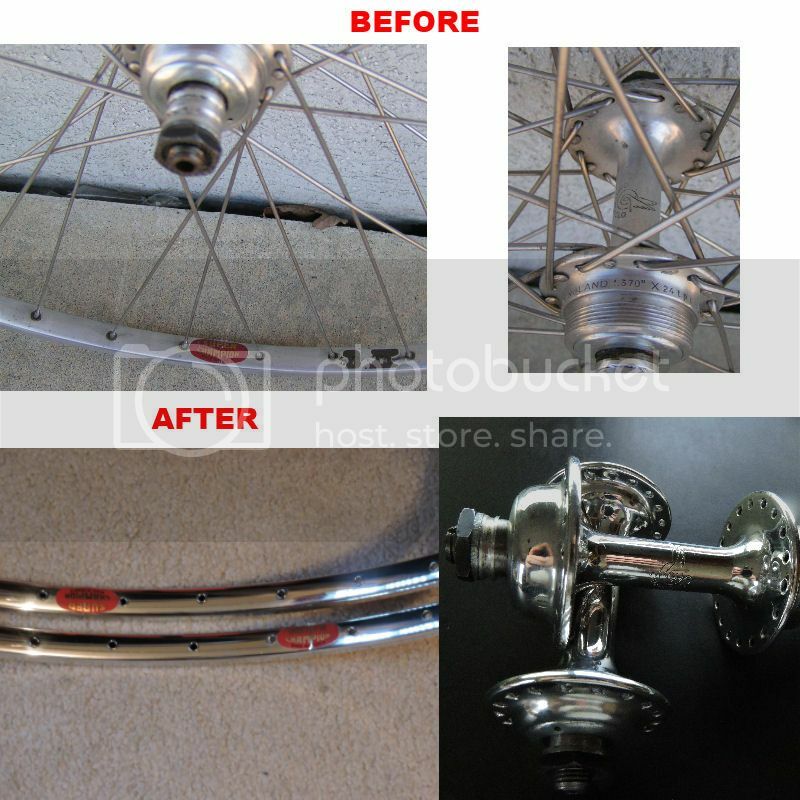 Later, when out on organized rides, my alloy wheels were mistaken for chrome steel on more than one occasion! I'm currently amassing components for an '80s Japanese build (hopefully a miami vice/cim frameset). So, when doing a fresh build, it's gotta have shiny alloy.